Place parsley & corianderr into the food processor and pulse until minced. Add all of the remaining ingredients and pulse until combined. Add a tablespoon of tahini paste to bind if necessary. Chill for one hour to firm up the mixture. With an icecream scoop shape the mixture into flattish balls and gently dry fry in a non stick pan with a lid on or bake in a pre-heated moderate oven for 15 minutes and serve with lemon wedges, or a fresh cooked tomatoes for a little moisture as baked falafel are drier but healthier! 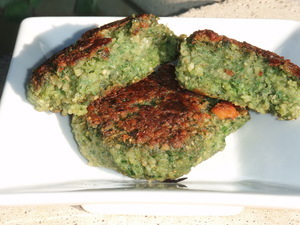 For a moister falafel you can add 1 cup of mashed cooked sweet potato to the mixture.